Printed at the Theater, for Moses Pitt at the Angel in St.. Pauls Church-Yard, London, 1680-1681-1683-1682 4 volumes. Folio (21 4/8 x 14 inches). Letterpress title-pages, two printed in red and black and with small engraved vignettes, letterpress in volume one ruled in red throughout. Fine engraved portrait of Charles II, engraved by R. White, in volume one by (laid down on heavier stock at an early date) and double-engraved plate of Laplanders by F. van den Houe with magnificent original hand-colour in full, 3 further folding plates and 166 double-page maps of the world by John Seller and Janssonius and Northern Europe, all with original hand-colour in part, the cartouches with original hand-colour in full, those in volume one occasionally HEIGHTENED IN GOLD and gum arabic, all cartouches and other fine details in volume IV HEIGHTENED IN GOLD and gum arabic, all maps in this volume ruled in red (world map by Seller trimmed and laid down on heavier stock, volume one without map 35 'Ducatus Stomariae' and 40 'Regni Norvegiae'; map 35 in volume II 'Marchia Vetus' trimmed and laid down on heavier stock; volume III with maps 'Totius Sveviae', 'Walachia' and 'Iuliacensis Ducatus' trimmed and laid down, without map 126 'Diocesis Leodeniensi' but with additional map 'Oldenburg'; volume IV lacking map 141 'Fossa Eugeniana' but with additional map 'Namurcum Comitatus'). Fine contemporary blind paneled smooth and mottled calf, the spines in 8 compartments with 7 raised bands, one lettered in gilt, the others decorated with fine gilt tools (expertly rebacked preserving the original backstrips, a bit rubbed). Provenance: with the engraved armorial bookplate of George Tollet Esq. (d. 1719), mathematician and naval administrator, on the verso of each title-page; with the engraved armorial bookplate of the Weston Library of the Earls of Bradford on each front paste-down. First edition. The two world maps are John Seller's "Novissima Totius Terrarum Orbis Tabula..." (Shirley 460) and Pieter van den Keere's "Nova totius terrarum orbis geographica ac hydrographica tabula" in the revised Janssonius, post 1620, state (Shirley 504) with a dedication to the Bishop of Oxford in the upper left. The map of the North Pole is Janssonius's "Nova et accurata Poli Arctici" and not that of Moses Pitt. The remaining maps are of Northern and Eastern Europe, all based on Dutch cartography, as Pitt's intention had been to publish a mammoth atlas to rival that of Blaeu, "giving a reprise to many of the plates which Janssonius had acquired over the years, some of them going as far back as the stocks that were used for Mercator's Atlas" (Goss) . However, as with many grand publishing designs the venture faltered after only these four volumes. The maps in volume one, in addition to the world map, and that of the Arctic, are of Russia, Poland, and Scandinavia; volumes II and III are of the German Empire; and IV contains the Seventeen Provinces of the Low Countries, or Netherlands. 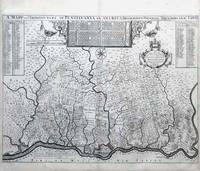 Moses Pitt was neither a cartographer nor a scholar, yet in 1670 he undertook a project that came to be called 'The English Atlas'. Despite the seemingly difficult, if not unrealistic, task at hand--hardly mitigated by the paucity of skilled commercial cartographers in England--Pitt's endeavor was backed by Sir Christopher Wren and Robert Hooke, and his partners included the Dutch map publisher Jan Jansson and the Englishman Steven Stewart. 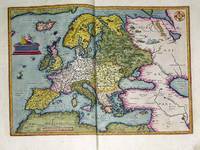 Based on the concept of the Atlas Maior by Joan Blaeu ,Pitt's atlas was to consist of twelve volumes, but only four were completed (covering places "next to the North-pole," Muscovy, Poland, Sweden, Denmark, Germany and the seventeen provinces of the Low Countries). 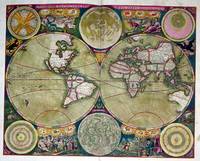 Pitt had envisioned the project as a reissue of a Dutch atlas in "English guise"--in which existing Dutch maps would be repackaged with accompanying text in English--whereas his partners envisioned the printing of an atlas with entirely new maps. Such conflicts, along with economic factors and the overly ambitious nature of the project envisioned, eventually led to its demise. After only four parts of the atlas were completed, Pitt was in financial ruin and was imprisoned for debt from 1689 to 1691. Nonetheless, the four volumes that were produced signal the sumptuous nature of the project, as the highest production values were lavished upon it in terms of engraving, paper and coloring. From the distinguished library of George Tollet, who in 1683 became a founder member of the Dublin Philosophical Society"a sister organization to the Royal Societyand would become one of its more active members: his experiments and presentations, as well as his correspondence with other scientists, including Edmond Halley, are often remarked upon in its minute book, which records his election to the position of treasurer on 2 November 1685... several of Tollet's contributions to the Dublin society's meetings involved applied mathematicshe presented papers on gunnery and on longitude, for example...In 1688 Tollet moved to England. Luttrell's parliamentary diary reports that Tollet was chosen secretary to the commissioners for taking the public accounts in March 1691; was made comptroller of the foreign post office in the room of Mr Brocket in May 1697; took a post at the custome house in November 1697; and in June 1700 was made secretary of the excise, worth £500 per annum (Luttrell, 2.192; 4.219, 306, 661). Not mentioned in Luttrell's diary, but noted by both Hinchliffe and Speake, is Tollet's appointment as accountant-general of Ireland, granted in December 1691" (Michael Londry for DNB). And from the library of the Earls of Bradford, probably Henry Bridgeman, first Baron Bridgeman (1725-1800) who inherited Weston Park from his mother's family in 1762. 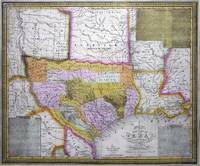 E. G. R. Taylor, "The English Atlas of Moses Pitt, 1680-83," Geographical Journal 95, 4 (April 1940), 292-299; Lloyd Arnold Brown, The World Encompassed, exh. cat. (Baltimore, 1952), n. 172; Rodney W. Shirley, The Mapping of the World (London, 1983), n. 504. Catalogued by Kate Hunter. VALK, Gerard (1650-1726) and Pieter SCHENK (1660-1718). MOUNT, William (1688-1769) and Thomas PAGE (1704-1762).